Here is a guest blog from David Johnson…(also posted on transitionculture.org) - see also recordings and notes from the sessions. This past weekend, I attended "Renewal LA," an interfaith gathering here in Los Angeles which included sections of the documentary film "Renewal" by filmmakers Marty Ostrow and Terry Kay Rockefeller. The event offered speakers such as Mary Nichols of the California Air Resources Board, and it featured renowned environmentalist and 350.org founder Bill McKibben. Renewal LA was hosted in an Episcopal cathedral. The opening blessing was given by representatives of the B'hai, Buddhist, Christian, Hindu, Jewish, Later Day Saints, Moslem, and Unitarian traditions (listed here in alphabetical order). It was amazing to see all these religious leaders standing shoulder-to-shoulder, reading pieces from their individual traditions -- so many paths toward the same end, that of humanity living more gently upon the earth. I came to this event in the wierd capacity of both outside observer and insider. While I consider myself fairly spiritual, I'm not a participant in any particular religious tradition. I have the unique opportunity, however, to participate in many events which explore the crossover of religion and environmentalism because I am the co-founder of the Environmental Change-Makers community group (which became the initiating group for Transition Los Angeles). My co-founder at ECM is the Reverend Peter H. Rood, Jr., an Episcopal priest. I often refer to myself as the "secular environmentalist" part of the partnership. Because of Peter's connections and charisma, we are frequent speakers at religious communities in Southern California. As Transition US explores the topic of diversity, and proposes setting up a working group for Transition and faith communities, there has been a lot of interest in Peter's and my work. In today's post I want to share with you a bit about the Renewal LA event, and in a future post, some reflections about Transition issues and faith communities. The enticing fragrance of fresh yeasty bread beckoned us into Jen Ownbey's converted-garage bakeshop in Olympia, Washington. A huge variety of loaves graced her shelves: yeast breads, regular and gluten-free; quick breads with mixtures of grains; sweet treats. While we chatted, she whipped up a batch of quick bread made with locally-grown zucchini — without using a recipe! This coming weekend, one of our local Transition groups in Los Angeles will offer a Vegetable / Herb Seed Swap. We've held several seed swaps before -- one each spring and one each autumn for our year-round Southern California growing season. Seed swaps are lots of fun. People gather to exchange seeds, but at the same time they swap garden stories, garden tips, and generally connect with each other around food gardening. We call ours a VEGETABLE / HERB seed swap so that we are making it clear from the very start that this garden event isn't about ornamental flowers. Our group sets out to encourage people to grow food. A conversation with three co-editors of Squat Birth Journal wasn't on my original taping schedule. But when they contacted me, I thought it'd be a great topic for a show. Natural child birth, birthing without interventions and drugs, is about as sustainable an alternative (to the medical system) as it gets. What could Life After Oil possibly be like for our local area? That's the question nearly 50 people in Los Angeles studied this past weekend at a one-day mini-conference hosted by Transition Los Angeles. The event brought together people from all over the vast Los Angeles and Southern California areas. The event gained attention from established area environmental organizations including the Surfrider Foundation and LA EcoVillage. 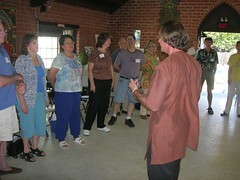 Many of the participants were newcomers to the ideas of the Transition movement.